Yes €50 and this includes a Free cycle jersey for the first 200 registered by July 1st. How many routes this time ? We hope to have 3 routes. 3. A 100KM route for the experienced starts at 8am. There will be water stops en route. Is it open to under 18s? Is this designed to raise money for the club? Absolutely - Its one of our flagship fundraising events. Where will it finish up? Terenure Sports Club (CY) Terenure Village for a complimentary burger and drinks ! Showers and changing facilities will be available at CY. The TSS GFC Cycle is intended to provide every cyclist with the best event experience. In order to do this it is necessary to lay down the following regulations for the smooth running of the event. 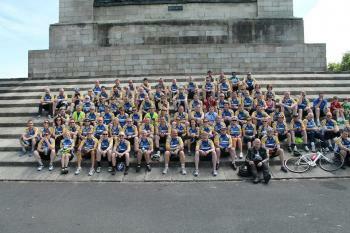 The 100km Cycle starts at 08:00am 19th August from Terenure College with registration and coffee from 07:00am. Safety approved cycle helmets are compulsory and must be worn at all times when cycling. You must be aware of other cyclists around you and enable faster cyclists to pass you. Please look over your shoulder before overtaking. You must use a bike that complies with the following rules and is deemed safe for the purposes of the event. You may not deviate from the official route. It is the Participant’s responsibility to provide and use a roadworthy bicycle and helmet which comply with rules and regulations. You may not use your mobile phone while riding. You must stop at the side of the road if you need to make or receive a call. You may not use a music player with headphones while participating in the event. The Participant acknowledges that participation in the Event is physically strenuous. It is acknowledged that participation in the Event will be physically demanding and the Participant is aware of the nature of the Event and associated medical and physical risks involved. If in any doubt you should consult your Doctor / Consultant.